When a number of dead fish are found in one place, the incident is referred to as a fish kill, and there is significant reason to suspect pollution. The three main causes of fish kills are poisoning, disease, and suffocation. ©Reuters New Media Inc./Corbis. Reproduced by permission. Fish may be poisoned by a wide range of polluting substances, including pesticides, acids, ammonia, phenols, cresols, compounds of metals, detergents, or cyanides. Many of these substances are used in industrial processes or in agriculture and are released through drains or are accidentally spilled into waterways. Acid rain, derived from industrial pollutants in the atmosphere, causes rivers to become toxic for various kinds of fish. Some types of toxic algal blooms kill fish. During the 1990s the dinoflagellate Pfeisteria piscicida caused fish kills, ranging from a few hundred to a million fish at one time, in estuaries of the southeastern United States. In natural environments, disease alone does not usually result in mass mortality, but under the artificial conditions of a hatchery or an aquaculture operation, disease can spread rapidly and cause a fish kill. The disease may be caused by viral infections, bacteria, fungi, or internal or external parasites. In these same natural environments, it is more common for fish to be weakened by disease and then killed en masse by some stressful environmental situation, such as low-oxygen concentration, temperature extremes, or pollution. When fish move from cold water into much warmer water such as a heated effluent from a generating station, bubbles may form in their tissues and they die from gas bubble disease. Suffocation occurs when the oxygen concentration in the water falls below the level at which fish can survive. A common cause is eutrophication, which is the artificial stimulation of plant growth by pollution with fertilizers, sewage, or atmospheric fallout. When the excess plant growth decays, it lowers the oxygen concentration. The discharge of dead organic matter into a watercourse from a sewer or from an industrial operation has the same effect. The accidental spilling of a herbicide into a lake or stream may kill large quantities of aquatic vegetation, causing low-oxygen conditions. Nuisance algal blooms may also cause suffocation. In 1994 in St. Helena Bay, South Africa, a large bloom of toxic and nontoxic algae formed in an estuary and extended into the open sea more than thirty kilometers out from the shore. The bloom sank and decomposed, forming an area with almost no oxygen and with lethal levels of hydrogen sulfide. Approximately fifteen hundred tons of dead fish and sixty tons of dead rock lobsters were washed ashore. 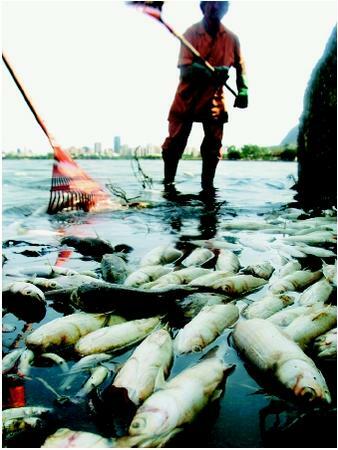 Many fish kills could be prevented by reducing the amount of pollution, especially nitrogen and phosphorus, entering waterways. Applications of fertilizers should be matched to the needs of the crop, sewage effluent should receive advanced treatment, and atmospheric emissions from industry and transport should be carefully controlled at source. SEE ALSO A CID R AIN ; A GRICULTURE ; H YPOXIA ; O XYGEN D EMAND , B IOCHEMICAL ; P HOSPHATES ; T HERMAL P OLLUTION ; W ATER P OLLUTION ; W ATER P OLLUTION : M ARINE . Burkholder, J.M. (1999). "The Lurking Perils of Pfeisteria. " Scientific American 282:42–49. Meyer, Fred P., and Barclay, Lee A., eds. (1990). Field Manual for the Investigation of Fish Kills. Resource Publication 177. Washington, DC: U.S. Fish and Wildlife Service. "Fish Kills Offer Challenge to DEQ." Available from http://www.leeric.lsu.edu/le .